A traffic warden has been criticised after he was pictured parking on double yellow lines. 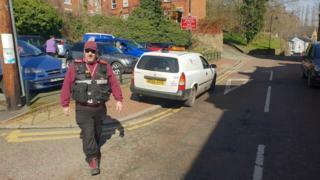 The enforcement officer for Wrexham council was photographed while out ticketing cars in Cefn Mawr. A garage worker took the photo and posted it on social media to highlight the "complete irony" of his actions, adding that the council had failed to tackle "overloaded" car parks. The council defended the employee and said he was exempt from restrictions. The photo has been shared by hundreds of people after it was posted on Facebook by a worker at Turner Automotive in Acrefair. People commenting on the post described the traffic warden as a "jobsworth" and said they were a "law to themselves". The garage worker, who did not wish to be named, spotted the warden while going to the village for lunch. "The car parks were overloaded and they have been for many years, but the council hasn't done anything about it," he told the Local Democracy Reporting Service. "What they have done now is to send out the traffic warden, which isn't really a cure to the problem." The worker said the warden "rocked up on the double yellows, stating to everybody that there was another car park down the road that they could use and there was no need to be on double yellows". "He said that if they remained there, they could be fined," he added. A spokesman for Wrexham County Borough Council said: "When carrying out enforcement duties, officers are expected to park in accordance with restrictions, where possible. "However, as enforcement is a statutory duty, officers are exempt from their restrictions if they can only park on a restricted area." Noting that the photo showed an empty parking space, the spokesman added: "We are assured that the space was occupied when the officer arrived."